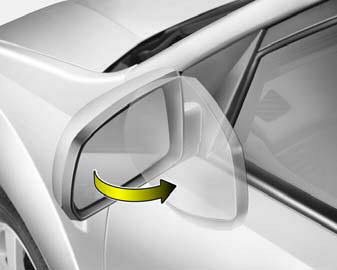 To fold the outside rearview mirrors, push them towards the rear. To unfold the outside rear view mirrors, push them toward the front. The outside rearview mirrors can be folded rearward for parking in restricted areas. Do not adjust or fold the outside rearview mirrors while the vehicle is moving. This could result in loss of control, and an accident causing death, serious injury or property damage.